The Scam- The caller says that they are a representative from your utility company (sometimes they do not even name RPU) and that you are past due. They say that if payment isn’t paid over the phone, then you will be disconnected. Be aware though, that sophisticated technology and newer phone systems make it look like they are calling from RPU’s customer service phone number (507.280.1500). RPU may have a check for you! The unclaimed check may be from a credit on your account or a rebate check that has not been cashed. These funds must be claimed soon or, by state law, the funds will be paid to the State of Minnesota. To see if you have unclaimed funds with RPU, click here to see the most updated list. Make sure to have a recent RPU bill available to reference your Business Partner Number. If you see your Business Partner Number listed, contact RPU at 507.280.1500. November 5, 2015, Minneapolis — The Rochester Neighborhood Energy Challenge was recognized this week with a Community Partnership award from the Rochester Energy Commission. 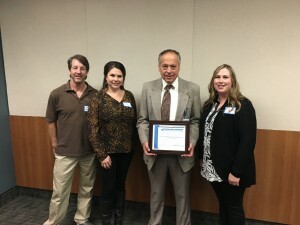 Center for Energy Environment shares the honor with its program partners Minnesota Energy Resources, Rochester Public Utilities (RPU), and energy audit contractor G.A. Ernst & Associates, Inc. In addition to its work with Neighborhood Energy Challenge and other regional programs, CEE is an active partner in Rochester’s community and energy development. At the request of the Destination Medical Center (DMC) Corporation’s board of directors, The McKnight Foundation engaged CEE this year to provide recommendations to advance the DMC’s energy and climate goals, coordinate energy infrastructure strategies and operating principles, and identify metrics by which various benefits can be measured. For more info, visit www.rpu.org/your-home/rebates-programs/energy-audits.html. The Center for Energy and Environment is a Minnesota nonprofit that promotes energy efficiency to strengthen the economy while improving the environment. For over 35 years, CEE has provided a range of practical and cost-effective programs to help Minnesota homeowners, businesses, nonprofits and governments reduce energy waste and save money. Online at mncee.org. Be Bright this fall! Through December 31, while supplies last, our residential electric customers are eligible for reduced pricing on ENERGY STAR® qualified LED light bulbs. We’ve partnered with the participating retailers listed below to offer discounted LED bulbs. ENERGY STAR-labeled LEDs use 80% less energy and last up to 25 times longer than incandescent light bulbs – but less watts doesn’t mean less light! LEDs produce bright light for less cost because they use less electricity and last longer than incandescent and compact fluorescent bulbs – saving time and money on replacements. By replacing the five most used bulbs in your home with energy-efficient LEDs, you can save about $40 in energy costs during the first year alone. LEDs also produce less heat than incandescents – improving safety. While these financial savings are a big draw, LEDs also offer environmental benefits to help make our community a little greener. Remember, supplies are limited, so get your discounted LEDs before they sell out! You are currently browsing the Rochester Public Utilities | Behind the Meter blog archives for November, 2015.